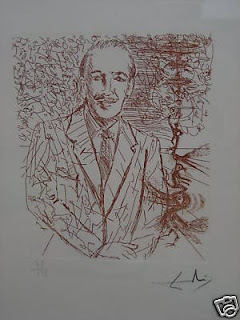 An etching of Walt Disney supposedly by Salvador Dali is offered on ebay at the moment. Any idea if it is authentic? I have my doubts. Are Myklebust who sent me the image refers us to this link to decide. My mind is pretty much made up though as to the fact that this is a fake. 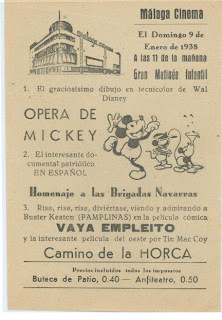 Very busy day today and not much time to update the blog, but I thought some of you might enjoy this Spanish flyer from 1938 that I have just received. I had always been curious to know what Tim Burton's concept art for The Black Cauldron looked like and just found out thanks to a friend who also happens to be a reader of this blog. 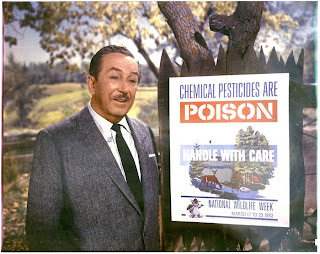 Disney Historian Jim Korkis wrote two articles about Walt Disney’s connection with Environmentality still available at this link. 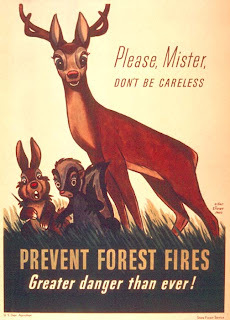 During his research, he ran across some interesting photos (including the fact that an adult Bambi promoted prevention of forest fires before Smokey the Bear was created). 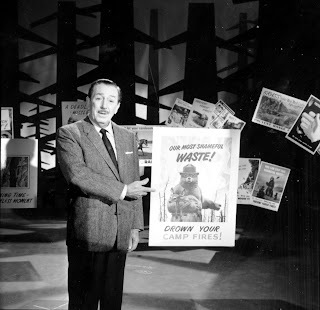 However, all of that research got him interested in the various Public Service Spots that Walt did in the late Fifties and early Sixties including ones for Toys For Tots and the National Society of the Prevention of Blindness. So Jim is looking for more information on what Public Service Spots Walt did and copies of the content. If anyone can help, please leave a comment. “You’ve probably heard people talk about conservation. Well, conservation isn’t just the business of a few people. It’s a matter that concerns all of us. It’s a science whose principles are written in the oldest code in the world, the laws of nature. The natural resources of our vast continent are not inexhaustible. 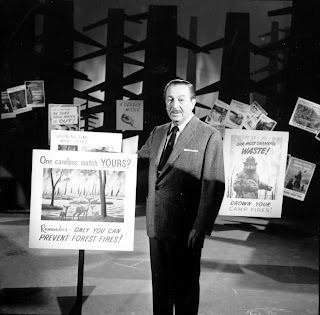 But if we will use our riches wisely, if we will protect our wildlife and preserve our lakes and streams, these things will last us for generations to come.” –Walt Disney National Wildlife Federation television Public Service Spot 1956. 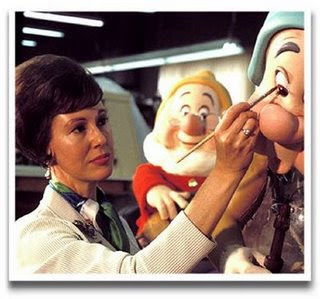 I have just realized that both Imagineer Harriet Burns and animator Charlie Downs both passed away last week. This is very sad news indeed. 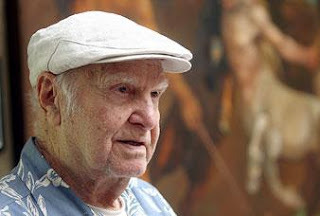 I have just received two fascinating interviews conducted in the '70s by John Culhane: one with John Hench about Dali, the other with story artist Art Scott. Would any reader of this blog be willing to transcribe them for me? They are tough as the tapes were pretty old and the background noise is therefore a bit problematic. I really need your help on this, once more. 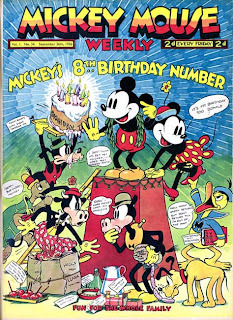 The magazine Toy Values Monthly from November 1991 (Vol. 1 No. 5) contained an excellent interview with former Disney artist Willis Pyle (pictured above) by animation collector Bob Casino. I would like to get the rights to republish it in a future volume of Walt's People, but need to get in contact with Bob Casino to achieve that first. Would anyone of you know how to contact Bob Casino? 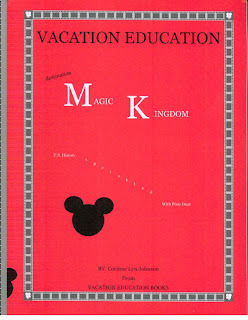 OK, I do not usually talk about guidebooks to the parks, but since the publisher of the books Vacation Education Destination Epcot and Vacation Education Magic Kingdom has decided to send me review copies, the least I can do is review them here. Both books are really good. The author has done her homework extremely well and if you are planning a vacation to one of those two parks with your kids you could definitely use them. The educational information, ideas to set-up activities and other advice to enjoy a very enriching trip with kids from 5 to 12 are all well thought through. The Disney-related information is also quite precise from what I saw and I even learned a few things myself, like the religious significance of the Mexican tradition of the Pinata. However, be warned that those books have a very strong Christian flavor. Too strong to my taste, in fact. The constant references to the Gospel and the Bible did bother me a bit and I did seriously cringe when "creationism" was mentioned in the Universe of Energy section. That's just me, of course. It is a holiday in Madrid tomorrow, so the blog will be updated again on Monday. This just in through Ross Anderson. A few months ago, while in New York, I had the chance to meet John Culhane for the first time. John was kind enough to praise Walt's People and mention that he would soon start contributing to the project. This is especially exciting as John has conducted taped interviews with Disney artists that no one else ever interviewed on tape: John Lounsbery and Bill Tytla among others. When I mentioned this to John, though, he objected about Tytla. "There is another taped interview that exists. I saw someone interview Tytla in Montreal in 1967. The person who interviewed him - I can't remember her name - was the daughter of a famous French director." I could not let this go by. A few weeks after that meeting I realized that the person who had conducted the interview was Louise Beaudet, who passed away in 1997 after having directed for many years the Cinémathèque Québecoise. I then contacted the Cinémathèque Québecoise and true enough, they had an unreleased interview with Tytla on tape. I have now secured a digital copy, thanks to the help of David Lesjak, Michael Barrier, Mark Sonntag and Don Peri. There are no surprises in the interview. I do not have the rights to release it in Walt's People and will not try to get those rights as the content does not justify any efforts. However, I thought some of you might like to hear Bill's voice for the first time. As you are aware of my passion for Brazil, it will not come as a surprise that I chose an excerpt where Tytla discusses his animating Jose Carioca. Click on this link to reach the page where the interview excerpt is hosted. Wait a few seconds till it loads, as it is a pretty heavy file. - Sleeping Beauty Castle Walk-Through To Return on Laughing Place. 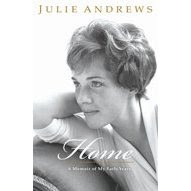 Sébastien Durand mentions that the book Home: A Memoir of My Early Years, the first part of Julie Andrews' autobiography, contains a few pages about her first meeting with Walt. The making of Mary Poppins will be featured in the second part of the autobiography. [Animation Mentor (AnimationMentor.com), the leading online character animation school created by animators for animators, today announced a panel discussion and tribute to the life, work and inspiration of Frank Thomas and Ollie Johnston which will take place on Wednesday, August 13, 2008 at SIGGRAPH in Los Angeles, California. 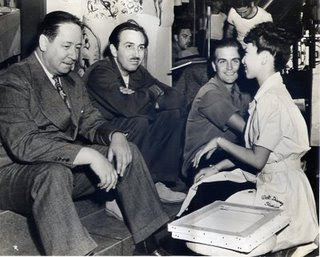 Frank Thomas and Ollie Johnston are two of Disney's famed Nine Old Men whose historic work includes Alice and Wonderland, Bambi, Jungle Book, Peter Pan, Pinocchio, Snow White and the Seven Dwarfs, and their acclaimed book on animation, The Illusion of Life. This extraordinary event reveals the past and future of animation through the eyes of true genius and includes a conversation about animation with contemporary animation legends from Disney Studios, DreamWorks Animation SKG, and others who were inspired by masters Thomas and Johnston. The panel will be followed by a short documentary by Animation Mentor of never-before-seen interview footage of these two animation legends. "We are truly honored to host this tribute for two beloved animators who have been an instrumental part of animation history and have entertained and inspired so many," said Bobby Beck, chief executive officer and cofounder of Animation Mentor. "We are thrilled to bring such a phenomenal group of talented animators who learned from Frank & Ollie and share a passion for the world of animation. The ability to also share Frank and Ollie's thoughts on animation through rare interview footage will be a special gift that we are proud to give to the world." Tom Sito, a professional animator and adjunct professor of animation at University of California Los Angeles and University of Southern California, will lead the panel discussion. -- Don Hahn, Disney Studios. Hahn is a two-time Academy Award winner and film producer responsible for producing some of the most successful Walt Disney animated films of the past 20 years, including Beauty and the Beast and The Lion King. -- Dave Burgess, DreamWorks Animation SKG. Currently a senior animator at DreamWorks Animation on Monsters vs. Aliens (in production), other work includes Bee Movie, Flushed Away, Over the Hedge, Madagascar, Shrek 2, and The Lion King. Burgess is also a mentor for Animation Mentor. -- Kevin Koch, animation director at Medical Cyberworlds, president of the Animation Guild, and mentor for Animation Mentor. Work includes Quest for Camelot, Prince of Egypt, Sinbad, Shrek 2, Madagascar, Over the Hedge, and Terra. I just received yesterday a book that I found really exciting. 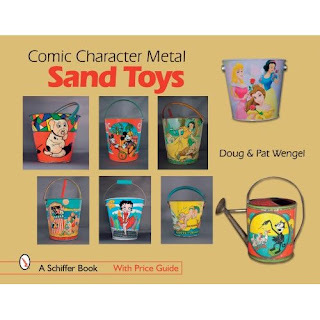 Comic Character Metal Sand Toys, written by world-famous collectors Pat and Doug Wengel, is pure delight for Disneyana collectors. Let me mention first that you should not be fooled by its name: despite the very broad title, the book focus is 90% on Disney and less than 10% on the rest. What makes it very exciting to me - aside from the fact that with 176 pages it is a really complete reference book and the fact that I discovered in it two photos of Kay Kamen that I had never seen before - is the shere number of pages that are dedicated to foreign Disneyana. In other words, unlike all recent Disneyana books that only focus on seen-so-often-we-can't-care-less US items, this book broadens the scope tremendously. As you know, I have been researching foreign vintage Disneyana for years, but even so I discovered quite a few treasures in the Wengel's book. In other words: a must-have for serious Disneyana collectors. [The Randy Bright book (The Disneyland Inside Story, 1987) and the Mechanical Engineering citation (1986) both have the story that Joe Fowler found the Alweg monorail and then told Walt. In the citation version, Joe Fowler AND Roger Broggie find it together, which is possible, as both of them were sent to Europe together to work on Brussels' World's Fair. Disney helped with the American Pavilion. 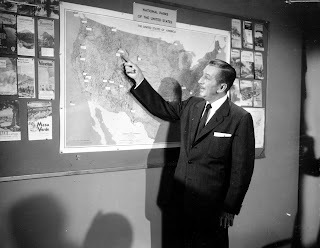 Walt also told them to look for rides/attractions/curiosities to bring back to Disneyland. 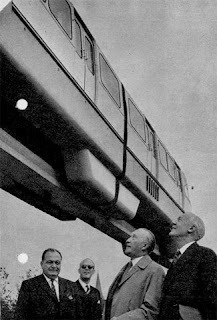 According to an Alweg company archival Web site (and most of today’s Disney historical sources), Walt Disney saw the first full-scale Monorail test train in 1958 while in Germany. He and Lillian were driving down the road and saw the saddleback monorail zooming overhead by accident and Walt followed the track and was confronted by people who only spoke German. After determining he wanted something similar for his theme park, Walt sent Disney Legend and former Imagineer Bob Gurr to Cologne, where he helped develop a scaled down Alweg line for Disneyland. On Oct. 20, 1958, Gurr presented his first designs of the Monorail train to Walt Disney. Todd James Pierce has also located two articles that appeared in the Los Angeles Times in early 1957 that clearly describe the ALWEG monorail system and also give the location of the test track. These were not small articles hidden in the newspaper since they were describing a possible deal to have an Alweg monorail system in Brazil. 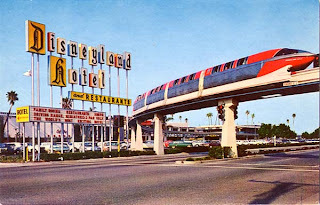 So the Alweg monorail was not a secret before Walt discovered it. 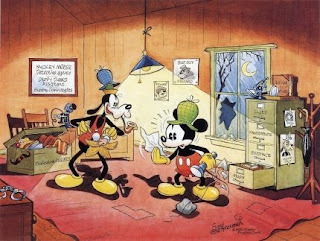 Jim Korkis just discovered a great site that features all of Floyd Gottfredson's Disney paintings. [The Disney Archives in California is doing a series of interesting seminars for cast members at the Disney Studios and I hope they are being taped for future researchers. 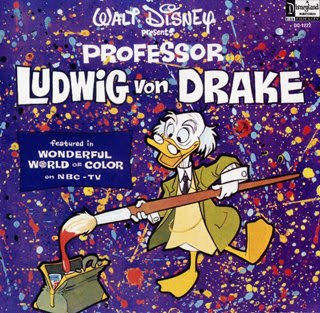 On Thursday, June 19th, Disney Author Jim Fanning gave a special seminar at the Disney Archives entitled: "Ludwig Von Drake and the Color Television Revolution" featuring “rarely seen clips, stills and advertising material”. 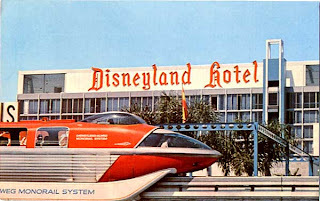 July 10th "Disneyland Parades & Events of 50s & 60s" presented by Robert Tieman. 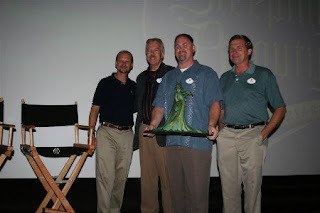 August 21 "Disneyland: The Way We Were" presented by Dave Smith. September 18th Q&A with Tony Anselmo. October 23rd "Haunted Mansion Collectibles" with special guest, actor & collector, Daniel Roebuck. November 13th"The Magic of Marc Davis" presented by Archivist, Rob Klein. 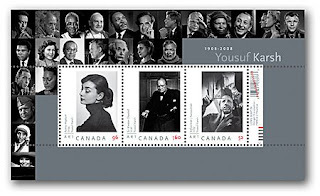 - 65 Years Ago Today... and 53 Years Ago Today... posted by Michael Barrier on July 17, 2008. And here is the second mystery of the day. I received today a short series of three letters from Thurston Harper to Dave Smith that will be released in Walt's People - Volume 9. Thurston Harper was an artist working for Disney during the Alice Comedies era and therefore fills a few small gaps realted to those days at the Studio. 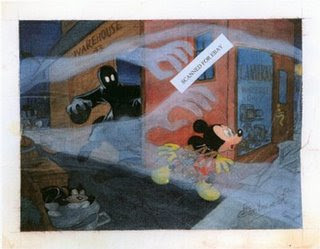 However, Harper also mentions that he returned to the Disney Studio from 1935 to 1937. I need to know more about Harper. Would anyone have a way to tell me what projects he tackled from 1935 to 1937 and when he passed away (probably in the '80s or '90s, since he was still alive and in good health in 1978)? Here is one of the two mysteries of the day: I have just received those photos of Disney gag drawings from a reader of the blog. Apparently there were more in the series. Would anyone be able to guess who is the artist who might have created them? The style looks oddly familiar, but I really can't place it. Here is a request for help from a reader of the blog. Any idea? 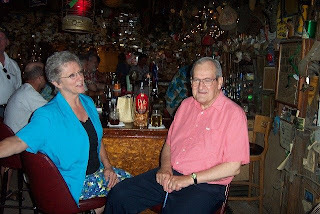 [The Big Bamboo was a small little bar near Walt Disney World that was home to many Disney cast members over the years and a favorite of late Disney Legend Ralph Kent. More information on the place can be found here: http://www.bigbamboolounge.com/. 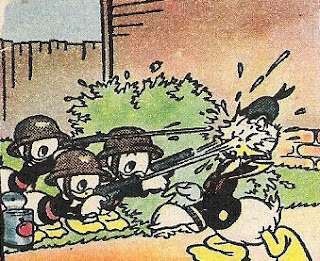 Ed Bergen who heads up The Carl Barks Fan Club just sent me the link of the club's site as well as some of the past newsletters of the club in which I found quite a lot of interesting information for anyone truly interested in the Duck Man. Definitely worth checking out. [Walt (and Lilly and Diane and Sharon) sailed back from Italy to the U.S. on the Independence in both August 1951 and August 1952, according to the immigration/emigration records available online, but Walt looks a little older in your photo than I would expect him to look on those dates. He and Lilly flew back from London on Pan Am after their summer 1953 visit. Just a few words to let you know that I have now received all the corrections on the manuscript of Walt's People - Volume 7. The only element missing to send it to the printer is the cover (which might take a few weeks for Pete Emslie to create). Volume 8 is progressing fast and I am starting to plan volume 9. In other words, this is becoming very exciting. 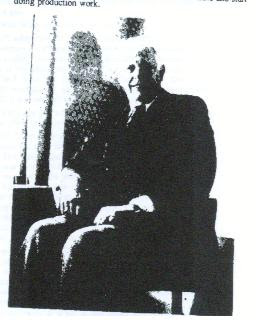 All the more so since John Culhane just mentioned that he has started sending me some interviews and since I was also contacted this weekend by Alan Coates, son of Claude and Evie Coats, who seems to have some fascinating material to share. This is looking good. I updated the Disney Books Network yesterday. This excellent article (pdf) about John Hench just in thanks to Jim Korkis. 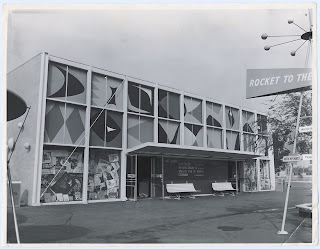 I believe I had never seen a photo of the Art Corner at Disneyland, so was very excited to discover this photograph being sold today on ebay by Howard Lowery. Unfortunately I then realized that it comes from the estate of Bruce Gordon, which depressed me quite a bit. 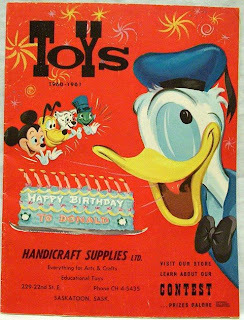 I received this document from Jim Korkis last month and should really have posted it in June for Donald's birthday. I forgot, so here it comes today for your enjoyment. Thanks to Vinny Poputo for having posted this marvelous 5-part series of videos on Youtube. An absolute delight. 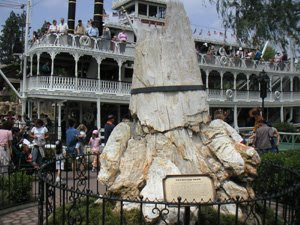 - More on Walt, Dolores, and Diego by Michael Barrier on July 7, 2008. 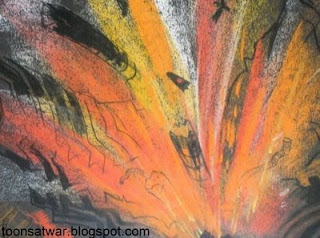 I will attend a training course on Tuesday and Wednesday, so no update on the blog until Thursday this week. 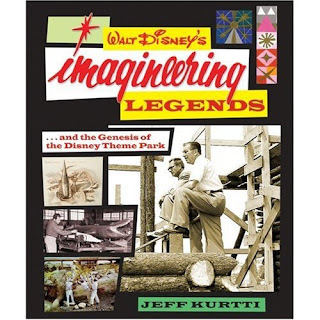 Next month will see the release of Jeff Kurtti's long awaited book Walt Disney's Legends of Imagineering and the Genesis of the Disney Theme Parks. I have asked Jeff to answer a few questions about the book. While it is clear from some of his answers that we approach Disney history from a different angle, I still have tremendous respect for the work he does and his is a book that I will definitely pick up in a few weeks. Didier Ghez: Why did you decide to work on that book? Can you run us through the genesis of that project? Jeff Kurtti: These days, a lot of what I do is motivated by the realization that I am getting older. 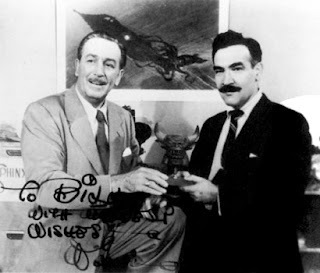 The farther we get from the core events and creative inspiration of Walt Disney and his team, the more important it is to preserve, document, and communicate the history, ideas, and identities of these people and projects. Certainly this idea is not unusual to you, Didier! The kind, quantity, and type of information about Disney history and personalities is very different from what was available to me as a young person. I felt a desire to create a record of some of the great people whose individual identities may have been limited by previous Company customs, or whose work within the greater body of a project or projects might be obscure with the passage of time. The inspiration for Walt Disney's Imagineering Legends was John Canemaker's Walt Disney's Nine Old Men. I say inspiration, since my book comes nowhere near the depth and erudition of John's great work, but the inspiration was to create a work that would familiarize people with the core team of creative people within the initial development of Disneyland. The animation group, as a rule, is more familiar to people, and the Imagineering group is less well-known, the history of how they came together is much less documented. It's very important for new generations of fans to get a proper introduction to this information, it's important for the Company to preserve a record that illuminates and contextualizes key periods of its history. I see the audience as manifold, with different levels of understanding or interest in the subject, and the tricky part is to appeal to an aficionado without alienating the uninformed. It's important for us "old guys" to understand that inculcating younger people into this information perpetuates and strengthens the culture of Disney beyond just consumer goods or entertainment. DG: What is the most exciting material you have unearthed for Imagineering Legends? JK: I never really set out to "unearth the unfound" within any of my projects. I think that's kind of a naive notion with a Company whose Archival work stretches over nearly four decades. There is simply a lot of information within the Company that has never been put together in a form that makes it accessible or pertinent to a public audience. The most exciting thing for me was to put together the stories of some of the people who, personally and professionally, I have found interesting. In many cases, these are people that I was fortunate enough to have met and worked with early in my career when I was an Imagineer in the 1980s and then over at the Studio in Corporate, so telling their stories had an aspect of personal satisfaction for me. DG: Did you conduct any interviews with former Disney artists for that project or special research within the Disney Archives? JK: I relied heavily on my own recollections of many of them, and of conversations over more than two decades, as well as on an abundant resource of interview material made available to me by The Walt Disney Family Foundation, The E Ticket Magazine, and (of course) the collection and cooperation of The Walt Disney Archives. My key advisor and co-conspirator on this book was Marty Sklar. Marty is currently the longest-term employee of Disney--celebrating 53 years this week. Marty looked through my proposal and outline, sat with me and discussed the form and content of the book, and suggested expanding it's scope to include even more people. He immediately saw the ability for this book to communicate a more personal history of the Imagineers, whereas other books have focused on projects and/or process, this one was about specific people. Also, if the book is well received, it opens the opportunity to follow up with similar works about more Disney people and projects. Then, as the content stabilized, Marty sat with me for a series of interviews that helped to contextualize the subjects, and highlighted aspects of their lives or work that helped to connect the artists with the works. Finally, Marty is legendary himself for a rather ruthless red pen of editorial action, and this book was no exception. On a personal note, Marty has long been an encouraging presence in my career. My first Disney writing was under his supervision at Imagineering in 1987 (a press release about the DNA Tower icon at the Wonders of Life pavilion at Epcot! ), and he worked closely with me on those first several issues of the WDEye employee magazine in the late 1980s and early 1990s. On many projects since, Marty has provided expertise, erudition, and a healthy conscience. As I say in the book's Acknowledgements, "It is fortunate for the goals of this project to have had the cooperation, collaboration, recollections, and insights of Marty Sklar, whose professional, personal, and profound relationships with the featured Imagineers brings a degree of expertise, credibility, and discernment to the narrative that would otherwise have been impossible. He is a large part of the continuity of the legacy of Walt’s Imagineers with those of today. Without his mindfulness of his responsibility to this legacy, much of the history of this organization and its creative philosophy and intellectual engine might have been lost to posterity." Marty is a Disney version of Hilton's "Mr. Chips," he has hundreds of "children." I'm honored to be one. None that I can think of, and revelation and surprise weren't really an editorial intent here, rather familiarization, context, and documentation. This is a work painted in somewhat broad strokes, intended for less a scholarly motive than a celebratory one. 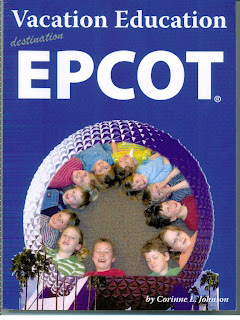 Preface: What is Walt Disney Imagineering? DG: Are you thinking of writting any other books about Disney history in the future? JK: Always. This is, I think, my twentieth book, there are four still to come later this year. 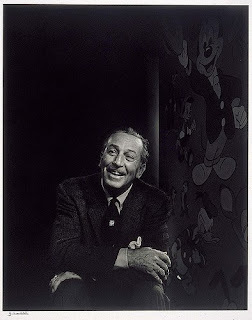 I am hopeful that my work with The Walt Disney Family Museum will suggest some projects in the near future, and I am forever annoying my gracious friend and editor at Disney Edition, Wendy Lekon, with ideas for Disney books that are far too out of the mainstream to even consider--but she listens, nevertheless. As you know, Didier, researching and documenting Disney history is a truly rewarding field, professionally and personally. Sharing this information makes it all the more rewarding. I was telling a group on a recent cruise on the Disney Magic, Disney is truly a world culture all its own, more in keeping with a faith than a corporation. It is our responsibility as its "congregation" to care less about what the pope and the cardinals are up to, and to simply study the scripture, sing the hymns, and pass on the word. This way, in addition to--and sometimes even in spite of--what the Company does, Disney maintains the core of its true cultural strength. The blog will be updated again on Monday. Happy 4th of July to all our US readers. [For the first time in more than 20 years, a brand-new Monorail placed its wheels on the beams of the Disneyland® Resort, as Monorail Red arrived Dec. 20, 2007 and began making test runs this month. Monorail Red is the first in the fleet of new Mark VII Monorails waiting to debut at the Disneyland Resort. One of the highlights of my trip to San Francisco, aside from a guided visit of the Museum project at the Presidio, was a lunch at Diane Disney Miller's place that included among others Diane, Ron Miller, Don Peri, the daughter of John Lounsbery, Andrea, and Mel Shaw. Andrea was kind enough to send me the following link to an article that appeared recently in a local newspaper about Mel and I thought you would like it. Please note that it contains some inaccuracies. For example, Florence died in 2004 and not in the '70s. Here is a book just spotted on Amazon that looks promising, to say the least. The Disney Sketchbook 1928 - 2008 by The Disney Animators. Disney's Dogs is a book that I am really looking forward to getting when it gets released in October of this year. Its author, Tamara Khalaf, who works for Disney's Animation Research Library, was kind enough to answer a few questions I sent her. Tamara Khalaf: The talented minds at the Animation Research Library (a department within the Disney Animation Studios which houses all the original animation production artwork) came up with the theme of selecting various cats and dogs artwork represented in Disney animated films to hang in the main Disney Animation Studios Building for an art display in 2003. The exhibition was intended to provide inspiration for the Bolt production. 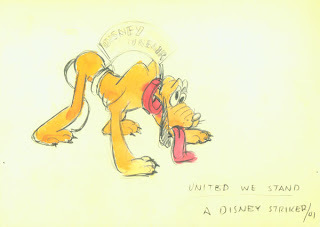 The art represented dogs and cats from several early shorts and feature-length Disney animated films. In 2005, I was asked to design an 8-room gallery exhibition for Tokyo Disneyland. With the success of the show at our studio, our team pitched the idea to Disney Imagineers who loved the family-friendly theme. The final exhibit contained over 500 reproduction images of cats and dogs from several Disney animated shorts and feature films, including Bolt and Lorenzo. As an avid dog lover, I wanted to see this show live on, and when the opportunity arose for our group to pitch various book ideas, my director, Lella Smith, encouraged me to pitch the concept that I had become so fond of. At the time I pitched the concept, I thought it would be a perfect complement to end the book with a chapter devoted to our newest hero, a canine named Bolt. DG: What is the most exciting material you have unearthed for Disney's Dogs? TK: I think the unearthing process was truly my favorite part of designing the book and working closely with my talented coworkers, researchers: Fox Carney, Ann Hansen, Doug Engalla and Jackie Vasquez. In particular, Ann was amazing and would continuously pop in my office with new and better artwork for the book. Sometimes when a spread wasn’t quite working for me, I would ask Ann if she could dig further into the stacks to find something to complement the vision in my head. Time and again, she rose to the occasion and presented beautiful artwork from the company’s legacy – artwork that hasn’t been seen in decades. 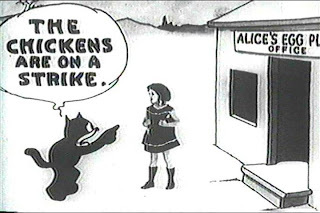 A favorite moment was when Ann discovered a cel set-up from Alice in Wonderland from the sequence Garden of Live Flowers during the song “All in a Golden Afternoon”. In the scene, a “cat-erpillar” (a cat’s head on a caterpillar’s body) sleeps curled up on a vine while an excited “dog-erpillar” jumps up, disturbing the cat-erpillar’s nap. Needless to say, that definitely made it into the book! Another favorite story is that one evening when John Lasseter was here to research Dumbo material for our story book, they stumbled across an image of a darling little Daschund sandwiched between two buns – like a hot dog! John simply adored the visual gag, so of course I needed to find the dog a home somewhere in the book. I believe the dog is currently in the index, as I had already completed designing the book at that point. TK: I did not conduct any interviews for the book, as it is really more of an art book than an historical retrospective. 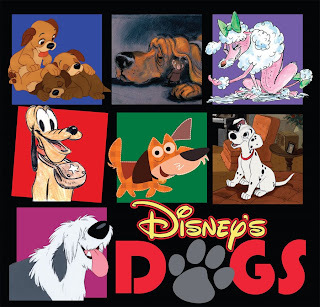 However, I believe this book to be a fairly comprehensive list of dogs that have appeared in Disney feature films and shorts. The special research involved time and patience in carefully wading through archival boxes of development artwork, story sketches, and animation to ensure that we had the very best images to support each chapter and some never-before-seen images from some favorite films. 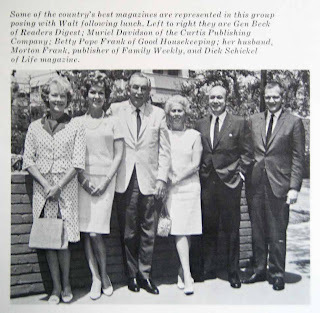 We do have a special introduction written by Roy Disney, and some fabulous family photographs of Walt Disney and various dogs which have also not been published before (thanks to the Disney Family and Diane Disney Miller). TK: There are two wonderful components to the book that will hopefully be a fun surprise. The first surprise is a chapter in the book which is entitled “Off the Leash” which humorously captures all the Disney dogs which aren’t quite dogs. This chapter came about as a result of two dilemmas: Addressing the inevitable question of what to do with Goofy – Is he, or isn’t he a dog? Although there is a definitive line between Pluto, whose characteristics are clearly more canine, and Goofy, who walks upright and is a close friend of Mickey and Donald’s, the question remained – where do I place Goofy in the book? The second question I encountered during my early research pertained to the anthropomorphic dogs, such as the enchanted footstool from Beauty and the Beast, and the sweeping broom-head dog from Alice in Wonderland. Clearly, I needed to set these “dogs” apart from the others. Therefore, a new chapter was birthed to highlight the not-dogs of Disney animation. The other fun surprise is that I have included a double-sided flipbook section at the back of the book. Readers will be able to turn the book with the spine is at the top, binding the pages of animation, and the viewer can flip through to see two different scenes of dogs in action. As to which two scenes they are, I will leave that element of surprise to those who buy the book… but I thought it would be a fun and different device to include, and one that is not usually seen in a 7” x 7” bound book. Highlights the dogs from the company’s early history from the 1930s – 1950s, including early images of Pluto. Shows images from animated features including: One Hundred and One Dalmatians; The Fox and the Hound; Oliver & Company, and Lady and the Tramp. Showcases sidekick dogs that have left a place in our hearts. These include: Bruno from Cinderella, Nana from Peter Pan, Toby from The Great Mouse Detective, Percy from Pocahontas, Little Brother from Mulan, and a cast of many others. This is a whimsical look at dogs that may (or may not be) dogs. These include the strange broom-headed dog of Alice in Wonderland, Stitch (as a dog) from Lilo & Stitch, the enchanted footstool from Beauty and the Beast, Slinky dog from Toy Story I and II, Zero from Tim Burton’s The Nightmare Before Christmas, and the most controversial of all dogs, Goofy. This chapter will pay homage to our future canine hero, Bolt, who will blast his way into theaters in November 2008. DG: Are you thinking of writing any other books about Disney history in the future? TK: Our department is collaborating on writing and selecting artwork based on Disney fairy tales, focusing on the anticipated release of Princess and the Frog due holiday season of 2009. The catalogue will be designed for the New Orleans Museum of art in conjunction with an exhibition our department is curating for the museum, which will open in November 2009 (for any fans traveling or living near New Orleans, Louisiana). Additionally, I have two more ideas for books I would like to design (one is another art book, the other more historical). The first idea Jody Revenson, my amazing editor, is already aware of. The second I have not officially pitched to Disney Editions. As neither book has been officially approved, I am not at liberty to mention as of yet, but stay tuned. 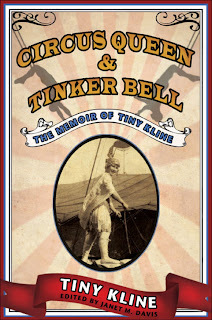 [Circus Queen & Tinker Bell: The Memoir of Tiny Kline, edited by Janet Davis, will be published on July 28. Tiny Kline was the circus acrobat who was the first Tinker Bell at Disneyland who flew off the castle. Wade Sampson has a column about her on Mouseplanet a year or so ago. I will probably not have time to update the blog until Thursday. Here are the links that you should not miss today though. 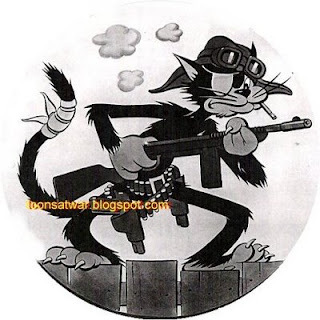 I have also corrected in my previous post, the link to Wade Sampson's article about World War One Walt.